A quick run through the salon and the sound of rushing water…under the sink! The hose between the hot water tank and the kitchen sink blew, and fresh (thank god) water was spraying all over under the sink. That wouldn’t have been so bad, but it has to GO somewhere, so it went down, through the acoustic overhead in the engine room, and under the cabinets and into the carpet in the salon. 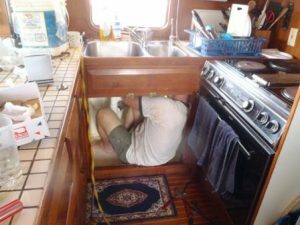 The ingenious Chief Ole, after shutting off the power to the water pump, figured out a way to block off the hot water portion of the flow…and the intrepid First Mate Jan ended up with cleanup duty, dancing on bath towels all over the carpet to mop up. The good news is we’re going to re-do the galley and clean the carpets anyway. More good news is we’re heading for a drier desert climate, hence the possibility of mildew is about nil. The bad news is we won’t have hot water for the next 24 hours. Oh well. Sailors crossed oceans for years without it. At least we have ice…and refrigeration…and cold beer! Once the water situation was handled and we were on a long run between waypoints, we noticed the anemometer wasn’t working. A quick peek up at the mast showed us it had come loose from its moorings and was dangling uselessly from the top of the mast. That made it even more interesting when, at about 7:30 p.m. (just in time for dinner), the wind whipped up a nice cross-current chop of 4-6 feet that we charged into headlong. We bucked like a dime store rocking horse for four or five hours, then things seemed to calm down enough for each of us to get a couple hours of sleep. 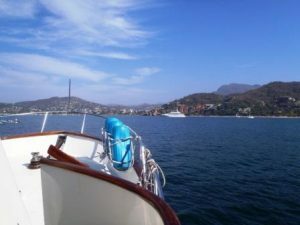 In spite of the pitching we made better time than we anticipated, arriving in Zihuatanejo Bay before dawn, and setting anchor off town (in the dark, among dozens of sailboats) just off Playa Municipal. We sat on the back deck until it was light enough to see where we were, and decided the rolling was not going to make for a liveable situation. So we picked up and motored over to the beach off Playa la Ropa, dropped the anchor again, and went to bed. We don’t know how long we’re going to stay here. It’s still a bit rolly and we’re about a mile from town. But the air is pleasant, the batteries are lasting us an incredible 12 hours, and the internet’s good!